Tecmo's classic Rygar series has finally returned on the Playstation 2 and it is one of the best action titles of the year. Fans of the series should be relieved to find that Rygar has a similar feel to the original. This is another revival that's made a solid transition from 2D to 3D. In fact, this is easily one of the best-looking PS2 titles to date and the production values are breathtaking. This ancient world comes alive with a cinematic feel, richly detailed environments and incredible boss battles. However, the gameplay can be a little annoying, but is this enough to ruin the experience? We find out if this new Rygar lives up to the legend. 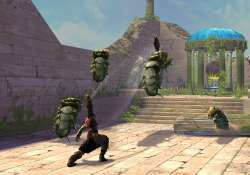 Set in the ancient island world of Argus, the game follows the adventures of its hero, Rygar. Unfortunately, a dark power has been released and the island splits apart. The citizens fall victim to a catasphrophic earthquake and flames. Those who survived faced larvae-like Titans that infested Argus. Worse, they've kidnapped the beautiful princess Harmonia, sending her off to a foreboding mountain. It's up to you to rescue Argus and the princess from the evil Titan who've taken over and want to take Argus and the world from the benevolent gods. In Rygar, you take control of the game's mighty namesake, a warrior who lives for the battle and is one of the most powerful ever to fight. 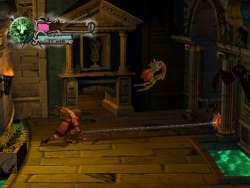 Rygar is a powerful and can lift objects and hang over the various levels. As in the original game, Rygar's Diskarmor is his main weapon. This has mystical power given when the gods themselves forged it. This is a retractable shield with great power. Rygar can find three different kinds of these representing Hades, Heaven, and Seas during the course of the game. Once you collect a new Diskarmor, you can then switch between them using the shift buttons. These Diskarmors have been forged by the gods themselves and are quite powerful. There are two types of attacks, short and long range and he can chain hits to make his attacks more powerful. In addition, he can purchase upgrades to enhance the Diskarmor. Rygar can also perform special moves and chains to make for even more devastating attacks. The Diskarmor can also act as a shield for defensive purposes. Aiming the Diskarmor isn't as difficult as it sounds and you can swing it around to make more accurate hits. This is especially useful when you're faced with multiple enemies. Each Diskarmor also has a unique Familiar, a special beast that he can summon during an attack, depending on how much energy remains in the Icol bar. As he progresses on his noble adventure, Rygar can summon more powerful Familiars. You should save these and only call up beasts to help you in boss battles, since most of the normal enemies fall quickly to your Diskarmor. In addition to this weapon, Rygar can slide, tackle and fight using several different types of combos, use the Diskarmor as a grappling hook to cross long gaps. Another important part of the gameplay is the destructible scenery. While its environments are beautiful, you'll have to destroy many of the statues and walls in order to get to areas they block. When these crumble, these cause the ground to shake and can sometimes unlock other areas thanks to the chain reaction. Most of the time, these destroyed objects reveal special mystic stones which can increase the power of the Diskarmor when you attach them to it. You can apply these using the menu screen, which is easy to navigate and understand. You can also find other items including Ambrosia, Nectar and the Power Sword. When collected, you can earn extra life and Icol energy, increase the strength of your attacks and can also earn points to buy upgrades. Rygar will traverse these vast worlds and face other obstacles, but there are frequent save points that are never far away. This makes Rygar much easier to play. This is especially true with the boss battles that can be quite intense. Rygar is challenging yet never becomes frustrating. It's difficulty progression makes the game easy to get into and hard to put down. It flows nicely with an excellent balance between battles and puzzles. 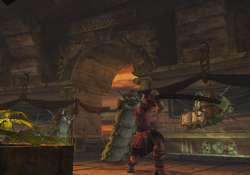 Much of the game involves exploration of the many shrines and temples in Argus. 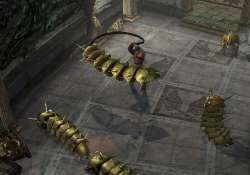 As you begin, you usually face a bevy of standard enemies that can swarm in groups. You'll face three types of Titans in the game. Some levels seem to have dead-ends, but sometimes, you can open up new paths by knocking down columns and walls. Rygar can slide underneath these small surfaces. However, you'll find large horse statues in certain areas that Rygar has to lift and turn that unlock doors. Rygar can also light the Discarmor at certain points, which will cause it to flame and can unlock the sealed doors. The levels are massive and there is some backtracking, but this is not excessive and usually unlocks hidden paths. A helpful map makes things easier and can help point you in the right direction if you hit a dead end. Even though Rygar is a state-of-the-art experience, some episodes evoke the original game. 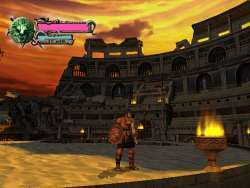 There's an area in the Coliseo stage where you have to run through a series of falling spikes as they retract. The larvae-like caterpillar Titans evoke some of the original Rygar enemies when they roll up in a ball and charge at you. These throwbacks are fun and veteran gamers should appreciate the references. Despite these pleasing throwbacks, Rygar also shows how much things have changed since the original game came out for the NES back in 1986. Rygar's graphics are simply amazing, transporting the player back into ancient times convincingly making for some of the most evocative landscapes seen in a console game to date. This ancient world of comes back to life with richly rendered environments with realistic water effects, fantastic light sourcing rendered with incredible detail and precision. You can see the small cracks in the marble columns, crisply detailed torches flicker and mystical clouds pour mysteriously upward. The overall design is spectacular and feels both magical and realistic. Rygar's world is stunningly beautiful with brilliant light sourcing and richly detailed environments that jump off the screen. A very fast frame-rate allows fast action that rarely slows down. Battles with standard enemies are intense, and this sets the stage for some breathtaking boss battles that are incredibly cool. Rygar implements a fixed camera angle which stays locked for the majority of the game, though there are some areas where the camera pans. Transitions are a little bit abrupt at some points. This system works well for the most part, since you don't have to waste time fiddling around with an extra viewpoint control. However, this can make it difficult to see where you are on a level and from where the enemies are attacking. This can be further confusing since you keep moving in the same direction when the perspective changes, though your instinct tells you to change the controls. Some of the camera angles are questionable and make things more confusing than they should be. However, this does allow for some spectacular camera settings that give Rygar a truly cinematic feel. Adding to the production values is the game's excellent classical score, which is performed by the Moscow Symphony. This music is appropriately epic and it fits the mood and pace of the game perfectly, swelling when Rygar faces off with an epic boss and receding during the quieter moments. It serves as the perfect counter to the action and gives Rygar an epic feel. Rygar's voice acting is better than average and brings the characters to life vividly. The story itself is more interesting than the typically unimaginative videogame plotline. Rygar's biggest fault is that playing it becomes repetitive after awhile. The enemies are cool, but there aren't enough of them, making their attack patterns predictable after awhile. To compensate for this, they become more powerful, but so does Rygar, which makes it a wash. The same puzzles and switches are repeated throughout the game, which also hurts the game's long-term replay value. 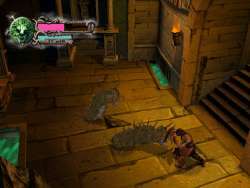 However, there are several different difficulty levels, so you can play through the game again at a harder level if you want to. While the visuals and production values are top notch, Rygar's fixed-angle camera system gets in the way of the action much too often. Rygar's gameplay improves greatly once you get used to the quirks. This is a highly entertaining game with tight-arcade style controls that are easy to understand. The gameplay has an excellent flow that offers plenty of action with a good amount of puzzle solving. Using the Diskarmor is loads of fun and this versatile weapon is surprisingly powerful, especially when you get the more powerful ones later on. Rygar is an awesome update that will challenge your skills as much as your reflexes with puzzles and intense boss battles. While Rygar isn't perfect, Tecmo deserves a lot of credit for intelligently updating this classic series without losing the essence of its appeal.